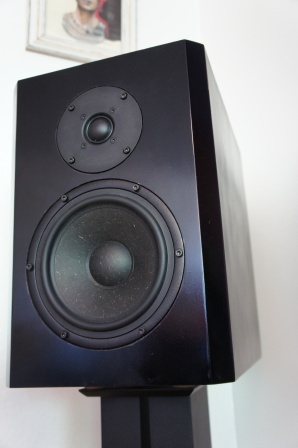 www.audioexcite.com » ZaphAudio ZA-SR71 Review! This time I’m not going to write about one of my own loudspeaker designs. Instead I will write a review and publish my measurements and cross-over simulations of the well-regarded Zaph Audio ZA-SR71 DIY loudspeaker design. The ZA-SR71 loudspeaker is designed by Mr. John Krutke. John has a unique feeling for bringing out the best possible sound from rather inexpensive loudspeaker drivers. He has a reputation of being a knowledgeable skilled designer and he has contributed to the DIY community for many years. I’ve only done one modification to the ZA-SR71 design by increasing the box volume from 14 to 18 liters. Otherwise I’ve used the same original cross-over design and cross-over components offered by Madisound ZA-SR71 loudspeaker kit. The ZA-SR71 is a medium sized 2-way stand-mount loudspeaker and the design offers several tuning options like tweeter level, reduced baffle step compensation, top octave response shaping and a system impedance flattening circuit. The ZA-SR71 uses driver units from the Seas Prestige series. The mid-woofer is a 7” driver with a reed/paper pulp cone and the tweeter is a 1” pre-coated fabric dome. Both these drivers are known for its low distortion capabilities and its high price/performance ratio. The ZA-SR71 uses the Madisound MD14BP speaker cabinets. This is a 14 liter cabinet that comes in several different finishes, but can of course be built by yourself as long as the baffle dimension and driver layout is kept. My version of the ZA-SR71 uses an 18 liter self-built enclosure. The baffle dimension is the same, but the box is deeper and the port tuning is lower than the original design. For details on the cross-over design, schematics and concept, please visit Zaph Audio website, which contains a lot of information regarding the ZA-SR71 loudspeaker design and tuning options. I’ve build the cross-over exactly as designed and have even bought the same cross-over components as Madisound offers in the ZA-SR71 loudspeaker kit. 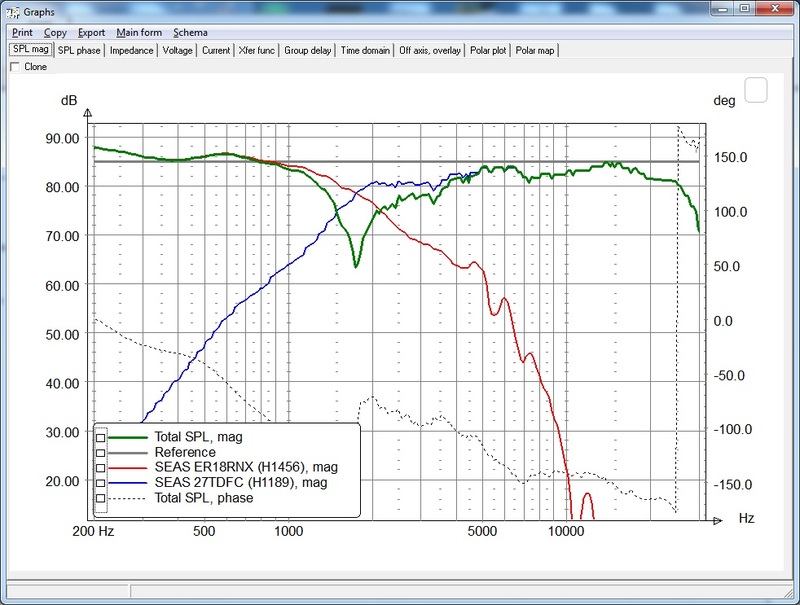 Upper Left: Tweeter-axis, on-axis 1m frequency response. 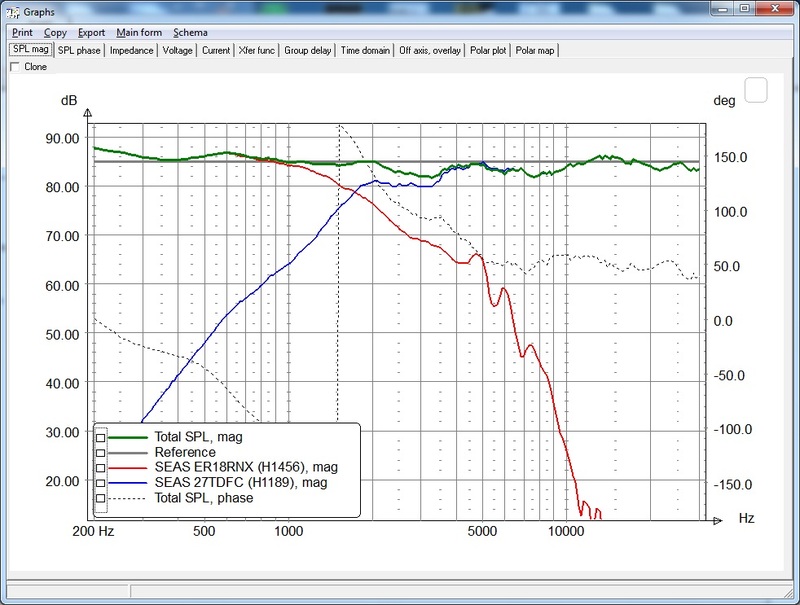 Upper Right: Tweeter-axis, 15deg off-axis 1m frequency response. Lower Left: Tweeter-axis, on-axis 1m frequency response with reverse null. Lower Right: Tweeter-axis, 15deg off-axis 1m frequency response with reverse null. On the on-axis measurements the baffle diffraction is clearly visible, but at 15deg off-axis or more, this is reduced and almost eliminated and causes no issues the off-axis frequency response. The reverse null is very deep centered on the 1.75kHz cross-over frequency. This indicates a good phase behavior between the two driver units and is expected for the targeted LR4 filter topology. The measurements and the cross-over simulation indicate that this loudspeaker is optimized for and based on the 1m measurements. What happens if we move to a 2.5m listening distance? 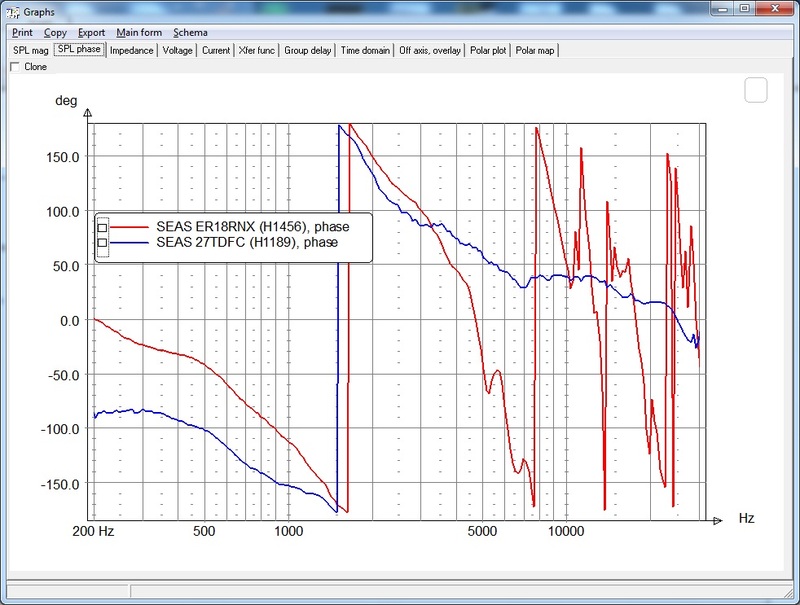 Upper Left: Individual driver unit phase response @ 1m. Upper Right: Individual driver unit phase response @ 2.5m. 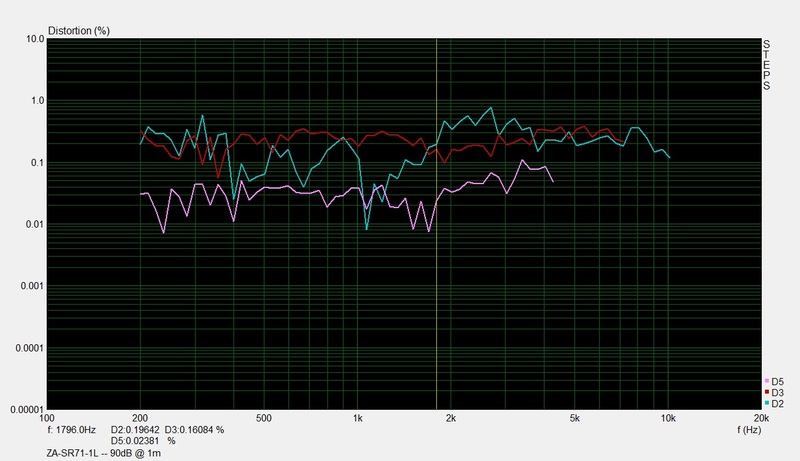 Lower Left: Tweeter-axis, on-axis frequency response with reverse null @ 1m. 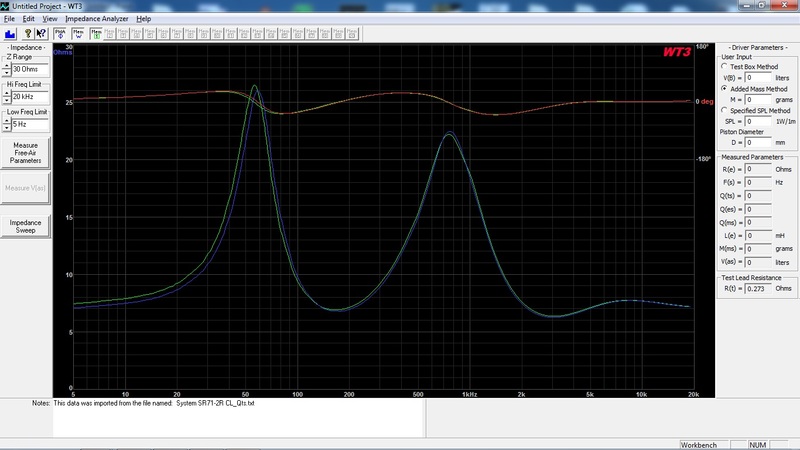 Lower Right: Tweeter-axis, on-axis frequency response with reverse null @ 2.5m. 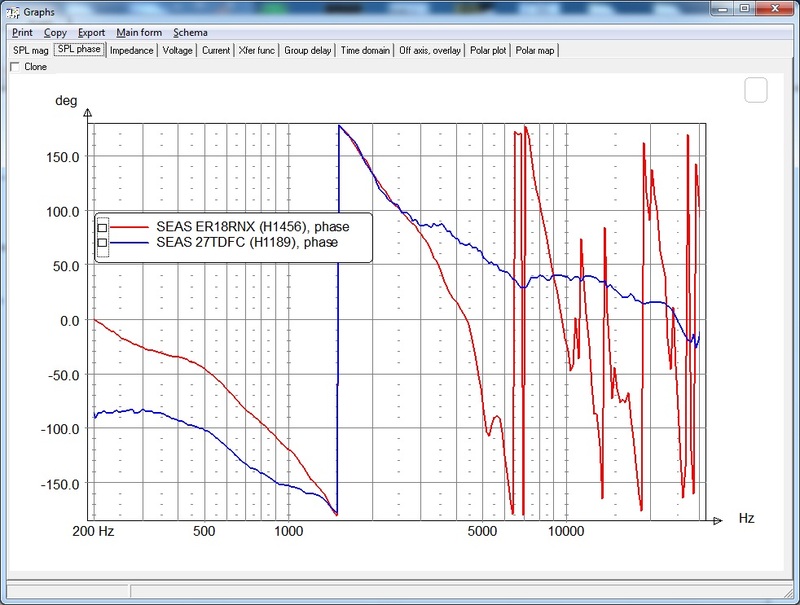 We can clearly see that we have some added phase distortion when moving the listening distance to 2.5m. The reverse null isn’t as deep at the 2.5m as at the 1m listening distance, which indicate not a fully optimized phase behavior. The added phase distortion is caused by the change in the relative acoustic center off-set between the tweeter and the mid-woofer when increasing the listening distance. This can be compensated for by slightly tilting the loudspeaker approximately 2-3 degrees back-wards. The change in the relative acoustic center off-set is about 7mm and aren’t huge by any means and the frequency response hardly changes, but if you don’t listen to this loudspeaker at a 1m distance the phase behavior isn’t optimal. Left: 18 liter box with port tuning at 38Hz. Right: 18 liter closed box. This should be an easy load for the amplifier. Left and right loudspeaker match each other closely, but there is a slight difference in the bass region due to a slightly higher resonance frequency for one of the mid-woofers. If nothing else is noted in the comments, the following frequency measurements of the loudspeaker are made at a 2m distance at tweeter height and for the 0db tweeter reference level. All frequency response charts are presented in a 50db scale with 1/24 octave smoothing and the measurements are valid down to 350Hz. The distortion measurements are done in near-field and the amplifier output level was adjusted for the loudspeaker so that the fundamental is 85dB at 1m and 90dB at 1m. This setting simulates normal to medium-high listening levels. The ZA-SR71 has very low odd-order distortion and slightly elevated 2nd order distortion between 2-4kHz. 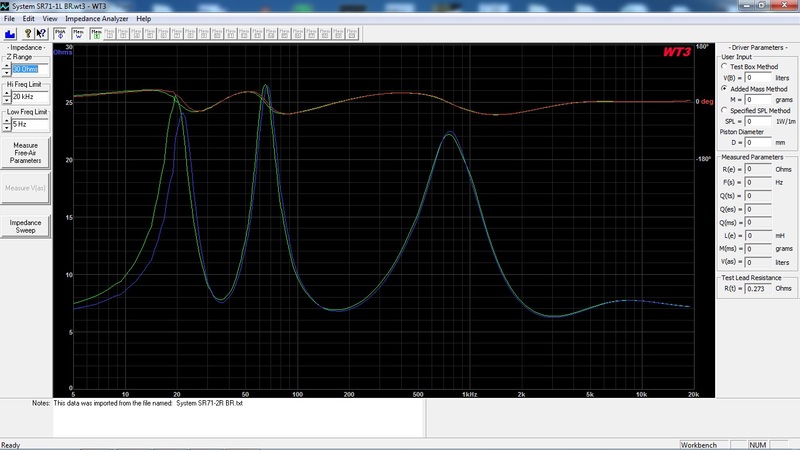 Overall, a very good distortion behavior for a loudspeaker in this price range. First of all I want to say that this review is my personal opinion and is based on my own sound preferences and design views and shouldn’t be consider as criticism to another loudspeaker designers design choices. The ZA-SR71 offers in my opinion a rather neutral character and presentation. In a positive way, no single frequency band sticks out and takes over. The sound is smooth, well-balanced and enjoyable. This loudspeaker is low distorting and it sounds relaxed even at relatively high listening levels. It has an average sized sound stage with a nice width and height, but to some extent a limited depth. The sound can be a bit grainy compared to more expensive designs as it doesn’t have the highest resolution and micro-detail ability. It’s still good considering the price for the driver units used in the ZA-SR71. The tweeter has a nice extension and top-end sparkle without sounding harsh or exaggerated. The ZA-SR71 is a well-designed loudspeaker with a high price/performance ratio. In my opinion it has only two short comings. First, the enclosure volume of 14 liter is in my opinion way to small. 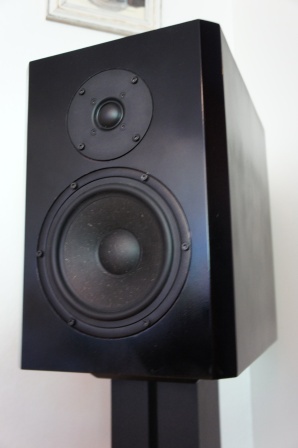 An enclosure volume of 18-19 liter is more appropriate for the ER18RNX mid-woofer. With a larger box volume and lower port tuning it sounds more relaxed, less congested and interacts with my room better. 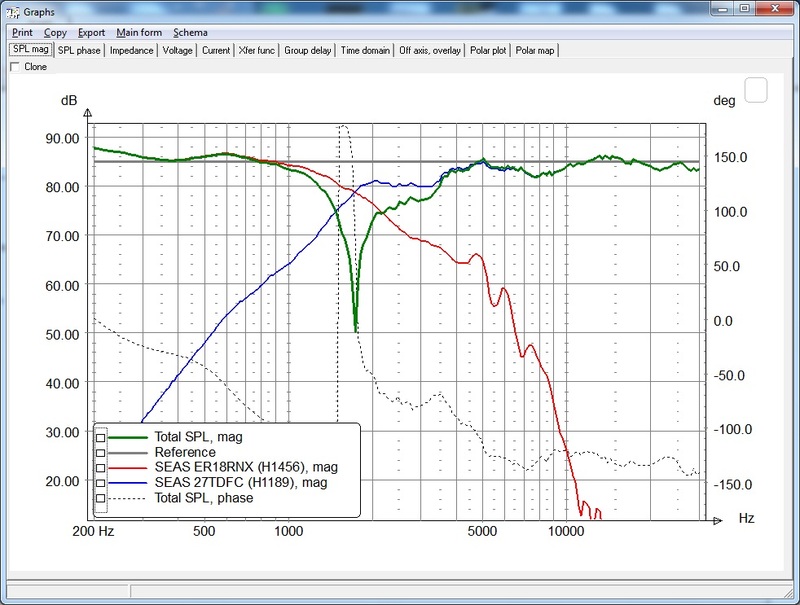 Second, the loudspeaker seems to be optimized and based on the 1m measurements. I hardly think most people sitting at 1m distance and listen to these loudspeakers and by moving to a 2.5-3m listening distance there are some added phase distortion. Not much by any means, but still there if you want perfection. Yes, the question is how much of this added phase distortion affects the sound quality? I think that’s up to each individual to explore and judge. I personally almost always optimize my cross-over designs for a listening distance of 2.5-3m, depending on the size of the loudspeaker. 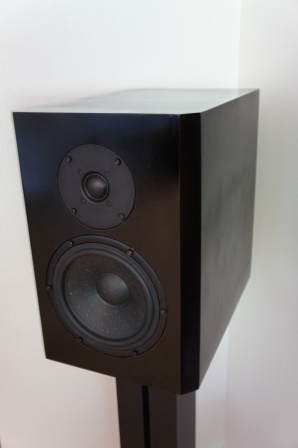 Thank you Mr. Krutke for sharing the DIY community such a well-designed and pleasant sounding loudspeaker!